I grew up in Chicago, and one of my favorite things about the summer has always been the thunderstorms. My father and I loved to stand on the porch in the evenings and watch the clouds roll in. Nick’s experience with rain is more along the lines of the steady, gray rain of the Pacific Northwest, but he has been in the Midwest long enough to appreciate our lively summertime weather. It’s a good thing we both like the storms, because we’ve had rain, thunder and lightening almost every day this week! Rain makes the crops grow, of course, and we appreciate not having to worry about irrigating in hot weather. Rain also makes some things more difficult. Our harvest and weeding crews spent the week splashing around in the mud (and Ray and I pitched in a little too). Water has pooled in the trenches between the ridges where the crops are planted. And when the fields are so wet, we can’t do any tractor work like cultivation, tilling, or bed shaping – unless we want to get stuck out in the field, that is! 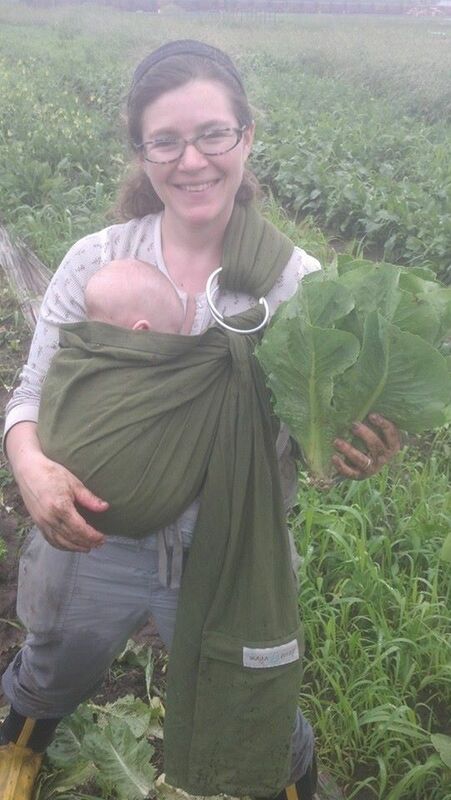 That means we have time to do a lot of hand-weeding – this week, the Saturday worker shares cleaned out the collard fields, freeing up the beautiful collard greens that you receive in your box this week. This coming week looks like it will be a little bit sunnier, and we are looking forward to catching up with our planting and weed-killing when the fields dry out. In the meantime, though, we’ll enjoy the light show during the storm that is forecasted for Monday – let it rain! Kohlrabi is the light green sphere with the large leaves attached. Remove the leaves from the bulb and store separately. Remove the beets from their tops and store the roots and tops separately. Eat broccoli crowns in the first few days after receiving them. Kohlrabi is a member of the cabbage family. The bulb can be peeled and sliced for a crisp raw snack (we like it with salt and lime juice) or grated as a slaw ingredient. The bulb can also be roasted, sliced thinly and grilled, and boiled and mashed (see recipes). Kohlrabi leaves are similar to collards, and can be combined with collards and cooked with them. Fennel is known for its characteristic anise flavor, which is very refreshing in hot weather. Thinly slice the bulb and add it, together with the chopped fronds, to a salad, especially one featuring tart fruits and nuts. The bulb can also be drizzled with olive oil and roasted or grilled – the heat brings out the sweetness of the bulbs.The on-line video “Cooking with a typical Summer CSA box” (courtesy of last year’s work-share Meghan) features a kohlrabi/fennel slaw recipe. Many folks are averse to collards, believing them to require long cooking times and expecting a bitter-tasting leaf. This could not be farther from the truth! Collards are similar in taste to kale, and can be sauteed like you would chard or kale – just cook them a little longer and remember to cut out the fibrous mid-stem from the leaves. Collards pair well with pork dishes and are delicious when cooked in animal fat, but can also figure prominently into vegetarian recipes (see below). Use baby leeks wherever you might use large leeks or onions in a recipe. To use green garlic, trim off root ends and any tough part of the green leaves. Chop or slice white, light green, and the first few inches of the dark green leaves (as long as they are tender). Use as you would green onions or garlic. (Thursday ) Beets can be boiled, roasted, used in soups and stews, and even shredded and eaten raw! Beet greens are much like chard and can be prepared in the same way that you might prepare other greens. (Thursday) Broccoli crowns are the “flower” of the broccoli plant, and the part most commonly eaten, but you can eat the leaves too – they are like kale or collards, and are really tasty. (Sunday) Bok choi is a vegetable that marries several textures – crisp stems and smooth green leaves. I stir-fry it in a little sesame oil and drizzle with soy sauce. You can add onion, leek, or garlic and meat or tofu to the mix – it i s a versatile companion to many other ingredients. (Sunday) Are you lettuce-ed out yet? This week, we have some great romaine lettuce in the box. This hearty lettuce stands up to beefy salad partners like croutons and creamy dressings, and even tolerated more harsh cooking techniques like grilling! Just cut in half lengthwise, drizzle with olive oil, season, and grill until slightly charred. Chop and serve with croutons and creamy dressing. We all love the yummy creaminess, butteriness, and salty taste of mashed potatoes. But did you you know that you can make it with other veggies other than just potatoes? Here is an alternative mashed recipe that uses kohlrabi. 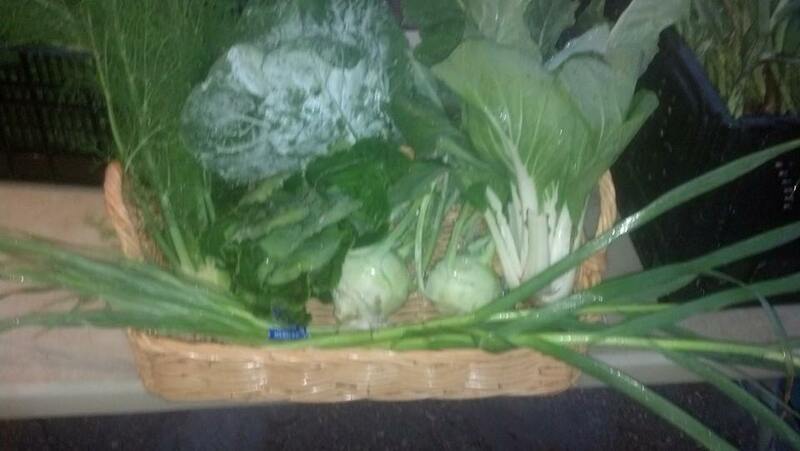 You can also fold in some sauteed collards or swiss chard, kale or spinach. Place the potatoes and kohlrabi in a steamer above 2 inches of boiling water. Cover and steam 15 to 20 minutes, until tender. Drain, cover tightly and allow to sit for 5 minutes, to steam and dry out. Mash with a potato masher or through a food mill fitted with a medium screen. Add the yogurt and the butter and mix together until incorporated. Season to taste with salt and pepper. Rinse the beans and pick over them to remove any debris. Cover with water and either allow to soak at least 8 hours or do a quick soak by bringing to a boil for 1 minute and then allowing to soak for an hour. Keep soaking until you are ready to cook, and then drain the soaking liquid. Heat a large pot or pressure cooker; spray lightly with olive oil if desired. Add the onion and celery and cook, stirring, until softened. Add the garlic and ginger and cook for another minute. Add the drained beans, 7 cups of water (6 if pressure cooking), thyme, chili powders, allspice, and nutmeg. Bring to a boil. If pressure cooking, lock on the lid and bring to high pressure. Cook at high pressure for 9 minutes. Remove from heat and allow pressure to come down naturally. If cooking in a regular pot, simmer until beans are very tender, 1-2 hours depending on your beans. If beans seem too dry, add additional water. Once beans are tender, puree using a hand blender or in batches in a regular blender. Return to pot and add remaining ingredients, except orange juice, and add salt and chili powder to taste. Simmer until carrots and collards are tender. Add orange juice just before serving. Serve garnished with orange slices on top or on the side. Wash lettuce leaves well and tear into bite-sized pieces. Combine 1/4 c. water, vinegar, salt, dill, and green garlic. Dress the salad leaves and marinate in the refrigerator overnight, and up to a few days.